The 2016 Cadillac CT6 ushers in a new era for GM’s preeminent marque, a full-size sedan outfitted with leading-edge technologies. The new model debuts in New York at month’s end, a five-passenger vehicle set to take on Audi, BMW and Mercedes-Benz. The all-new 3.0L Twin Turbo for the 2016 Cadillac CT6 is the only six-cylinder engine to combine turbocharging with cylinder deactivation and stop/start technologies to conserve fuel. In the chronology of Cadillac brand history, an 8.2-liter (500 cubic inch) V-8 engine once powered a handful of models, including Eldorado, Fleetwood and deVille. With an output of upwards of 400 horsepower, gargantuan engines once moved some of the largest cars ever built. Furthermore, this particular engine and others like it were built exclusively for the Cadillac brand. In more recent times, Cadillac has been using engines built by parent GM for its other brands. Cadillac’s once heralded Northstar series were the last proprietary engines used by GM’s luxury brand, although select Buick, Oldsmobile and Pontiac models also used them. In 2010, Cadillac retired Northstar, ending a 17-year tenure and ushering in a new era of complete powertrain sharing with GM’s other brands. A new, proprietary engine for the Cadillac brand will debut in the fourth quarter of 2015 and power the Cadillac CT6, itself an all-new flagship sedan for the marque. Last week, Cadillac shared details about this 3.0-liter twin turbo V-6 engine, carrying an estimated rating of 400 horsepower and 400 foot-pounds of torque. At 133 horsepower per liter, the new engine will be one of the most power dense engines in the world. It will also come paired with an 8-speed automatic transmission. Cadillac says that the packed power plant is the only six-cylinder engine to combine cylinder deactivation and stop/start technologies with turbocharging. This coalescence of scientific componentry will conserve fuel — to what degree has not yet been made known. “Cadillac’s elevation on the world stage is driven in great part by its advanced powertrain technology and the all-new 3.0L Twin Turbo powers past the traditional segment leaders with higher degrees of the performance and refinement their reputations were built on,” said Rich Bartlett, assistant chief engineer. The Cadillac CT6 will make its world debut in New York on March 31 in advance of the 2015 New York International Auto Show. This writer plans to attend that show. Cadillac is quick to point out that the new engine will outperform BMW’s 315-horsepower rated 3.0-liter V-6 as well as Audi’s 310-horsepower rated engine of the same displacement. These two German brands as well as the Mercedes-Benz marque are in Cadillac’s crosshairs, serving customers that GM desperately wants to poach. The twin turbo V-6 will not be the only engine offered in the Cadillac CT6. A new version of GM’s 3.6-liter, naturally-aspirated V-6 will also be employed, delivering an estimated 335 horsepower and 284 foot-pounds of torque. It, too, will feature cylinder deactivation and stop/start technologies and will include various noise-reducing features, including an all-new cam drive system, an upgraded cooling system, a stronger and stiffer aluminum block, and new high-flow cylinder heads. The benchmark engine for these upgrades is the Infiniti 3.7-liter V-6. 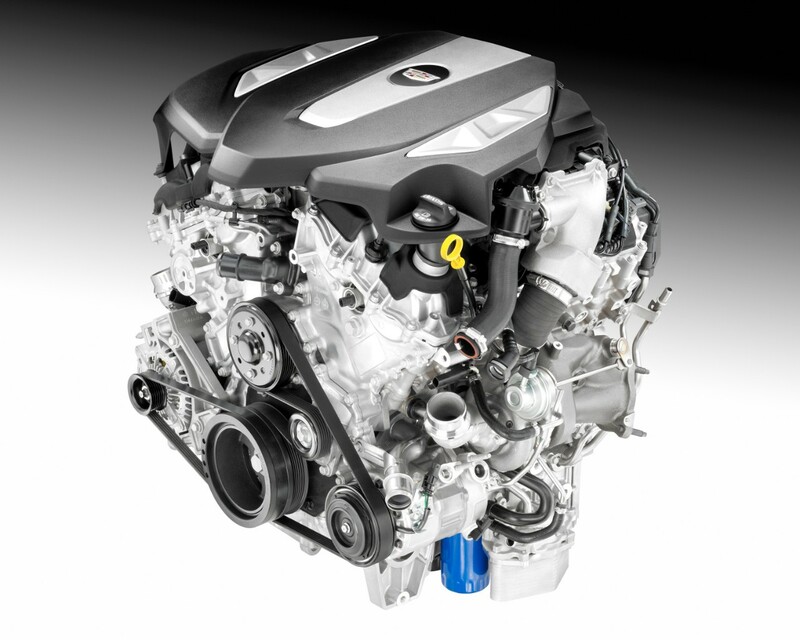 Other engines available in the 2016 Cadillac CT6 will include the turbocharged 2.0-liter in-line four-cylinder motor used in the Cadillac CTS. A V-8 engine is also planned and Cadillac has hinted that at least one other engine will follow. Auto Trends believes that the unidentified engine will be a turbocharged six-cylinder diesel, available for the European market initially, then to its North American customers. The Cadillac CT6 represents a bold step forward for this iconic luxury brand as it seeks to recover its once lofty position amongst premium marques. Moreover, it introduces a new naming convention, one that will roll out gradually over the next few years. Specifically, that nomenclature will pair two letters with one number in sequential fashion based on a model’s size and importance to the Cadillac brand.